Ask most people about an Amber Alert and they know right away what you are talking about: an emergency alert system that enlists the help of the media and the public in finding missing children who have been abducted. Thanks to forward-thinking leaders in two states, that concept might someday become just as well known in the hunt for criminals who kill or seriously injure law enforcement officers in the line of duty. The program will rely on a range of communications vehicles, including electronic message boards on highways and media alerts. The Texas Department of Public Safety and the Governor’s Division of Emergency Management are currently recruiting Blue Alert partners among public and commercial television and radio broadcasters; private commercial entities; local, state and federal government entities; and any others who can assist in spreading offenders’ information following an attack on a law enforcement officer. The concept is so simple and straightforward it’s surprising it hasn’t been implemented sooner and more broadly. But now that two of the nation’s largest states are on board, let’s hope the Blue Alert system takes hold nationwide. Data from the National Law Enforcement Officers Memorial Fund show that while officer fatalities (thankfully) are down sharply this year, a police officer still dies somewhere in America every three days or so. In those situations in which the offender flees, this type of system could be extremely valuable in quickly apprehending dangerous criminals who would harm our peace officers and the public. Read Governor Perry’s announcement, and encourage your state leaders to get on board with Blue Alert. Sheriff Lucius Amerson's fat Colt revolver is scarred and corroded from that night four decades ago when his patrol car crashed and burned while he chased a stolen vehicle down a winding road in rural Alabama. 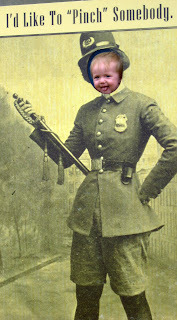 His size 16 1/2 shirts, on which he would pin his badge, name plate and "sheriff" in gold letters, are creased and yellowed. And the 1960s newspaper clippings from across the country noting Amerson's election as the first black sheriff in the South since Reconstruction are crumbling. 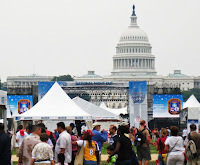 National Night Out at the National Mall! 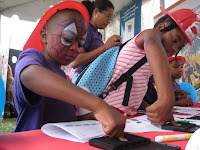 Thousands of DC-area residents and out-of-town (and out-of-country) visitors stopped by the National Mall yesterday to celebrate the 25th anniversary of National Night Out with Target, the DC Metropolitan Police Department, and Memorial Fund and Museum staff. National Night Out was a wonderful success for the NLEOMF. We got a chance to meet some great law enforcement supporters and interact with a staple of the National Mall and of Washington, DC - tourists! With clipboards in hand, Museum team members approached visitors with questions about their impressions of law enforcement movies and TV shows - the characters, the plots and the scenes that have come to shape the way we view law enforcement today. Who is your favorite TV or movie cop character? What is your favorite car chase? What is the best shootout? What is the best line from a cop movie or TV show? We hope to use the answers to our questionnaire to help form content for the Museum's "Reel to Real" Gallery. To try out the questionnaire yourself, and help us come up with ideas for the soon-to-be-built National Law Enforcement Museum, click here. Thank you to everyone who celebrated National Night Out 2008 - in DC or any other city! The key to keeping our neighborhoods, and our police officers, safe comes from the way we all work together -- families, communities and law enforcement. Check out the fun in our slideshow!